If you are anything like me (doughy, bookish, functioning eyeballs), and you grew up in the seventies or eighties, you have fond memories of the art of this guy: Richard Amsel. Here is a guy who, armed with only a pencil and some watercolors, and what I assume were huge pieces of paper, unleashed movie-scale awesomeness on our as-yet unjaded eyes. What kind of awesomeness? Try the poster for Raiders of the Lost Ark. Or the Dark Crystal. Or Chinatown. Or, Mu favorite, Flash Gordon. If your life were half as exciting as this poster, you’d probably die of awesome-poisoning. Thank you, Mr. Amsel for blowing our young minds. And thank you, Adam McDaniel for telling the story of the man behind the awesomeness. Awesome is right. Its so funny you mention him, I just got an email a while back asking for my main influences and I listed him as #1 (too bad the kid had absolutely no awareness of him). Growing up with his TV Guide covers on my coffee table made me bust out the pencil in a serious way more than anyone else. Thanks for the kind words about the site. I’m happy to say that more info will be coming in 2009 about Mr. Amsel’s artwork, and I’ll be expanding my original retrospective to coincide with it. I have the soundtrack to that movie. I bought it on purpose. 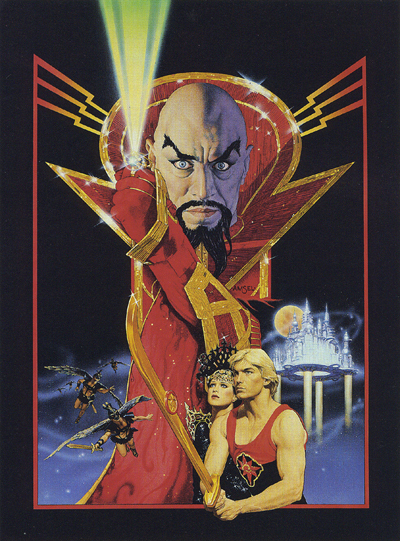 Wow, he really caputured Ming the Merciless and his crazy eyes! I’m afraid I wasn’t aware of who this Mr. Amsel was either. Until now, of course. Are you kidding? Whenever Queen’s “Flash” comes on in these parts we stop whatever we’re doing and sing along at the top of our lungs. Additionally, one of my favorite albums features “Ming’s Theme” as a rock song.